The Iria Beach Art Hotel Naxos is located in the well-known seaside resort of Agia Anna, on the western coast of Naxos, at close proximity to Naxos Town (Chora), the capital of the island. 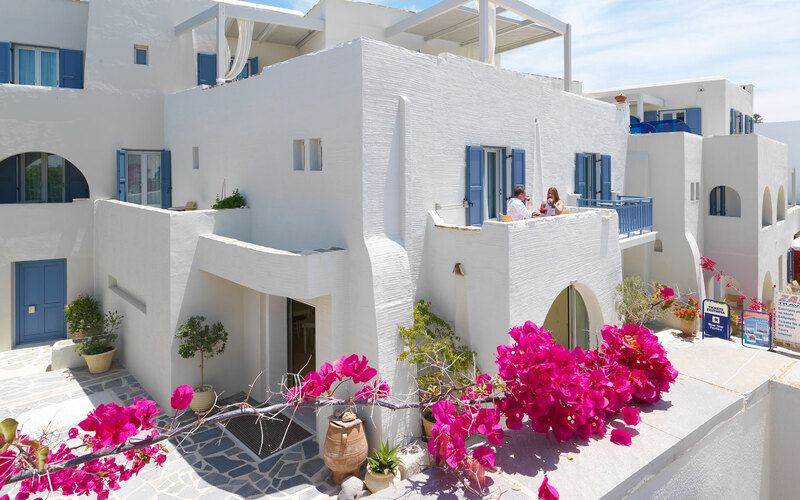 The hotel is built according to the traditional Cycladic architectural style and is situated right on the beach of Agia Anna, one of the most beautiful and popular beaches in Naxos. 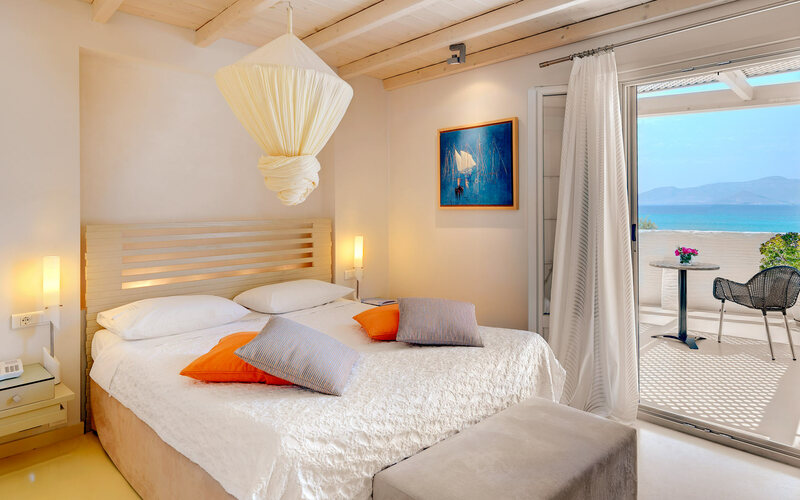 Guests of the Iria Beach Hotel in Naxos consider it one of the most charming Naxos Hotels. The Iria Beach Art Hotel Naxos Rooms & Suites in Agia Anna belongs to the 4-star **** category of Naxos hotels and operates from May to October. The settlement of Agia Anna lies on the western shore of Naxos Island, just a few kilometers from Naxos Town (Chora). It is considered one of the loveliest resorts in Naxos, with beautiful golden sands and clear waters. Visitors of Agia Anna are provided with a wide range of dining and entertainment venues to choose from, such as quaint tavernas, posh restaurants, quiet cafés and stimulating bars, where one can enjoy a delicious meal or a refreshing drink. 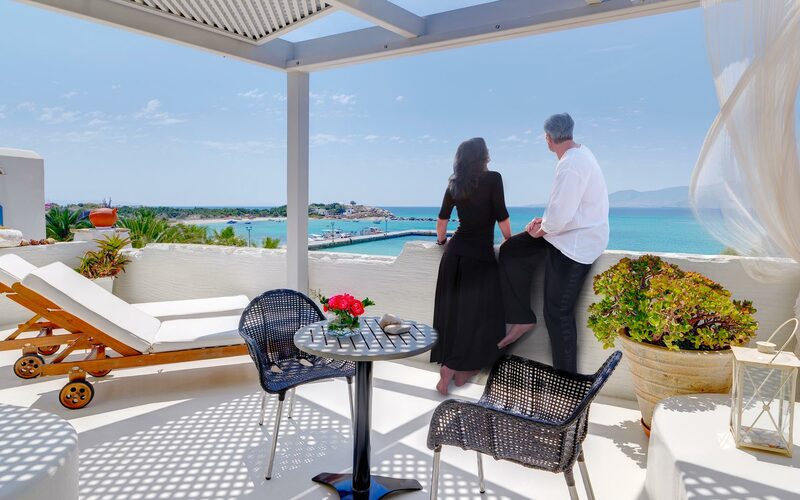 Naxos is the largest island in the Cyclades cluster, preferred by thousands of visitors every year who want to spend an enjoyable and carefree holiday in a charming setting. It is the ideal vacation destination, as it offers characteristics such as nightlife and entertainment venues, magnificent sandy beaches and fabulous historical and archaeological sites. Due to its popularity, Naxos Island has a very good tourist infrastructure, catering to all types of visitors, from single travelers and couples to large groups of friends and families.